Interview questions stand between you and the job you want. 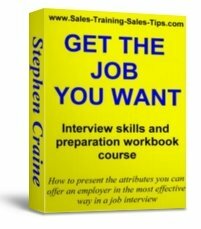 Take this job interviews workbook course and give yourself the best possible chance of getting the job you want. Answer interview questions with confidence because you have taken the right actions to prepare. I’ve interviewed people for over two decades and now you can learn the secrets from the other side of the interview desk. Imagine having help and interview tips from an experienced interviewer. This workbook will show you how to match all your experience and abilities to the interview questions that will be asked. To have an advantage over other candidates you need to know what to say at each stage of job interviews. When I’m interviewing candidates they often struggle to answer key interview questions. And the question that can be the last thing an interviewer remembers... Have you any questions for us? An instant download that you can start using today to prepare for your job interviews. 60 pages of job interview tips, how to prepare for job interviews, and secrets from an experienced interviewer. It takes you through an exercise program, using accelerated learning techniques that fully prepare you for the interview questions. Shows you how to select and present information about you, and your experience, during the interview. 15 exercises that bring all you can offer an employer into your conscious focus. The exercises show you how to match all your attributes to the expected job interview questions. All payments are made on the secure Pay Pal site, so you can make payments safely. Click the buy now button and you have the option of using credit or debit card, or using an existing Pay Pal account. It’s not a book, there’s no wading through hundreds of pages to find a few good interview tips. It’s a workbook that guides you through a set of exercises that will give you the best possible preparation for your job interview. It’s based upon my years of experience as an interviewer and recruitment manager. Many people go into a job being the best candidate, but they let themselves down because they don’t communicate their information in an effective way to the interviewer. Often it’s the best prepared person, or best communicator, that gets the job, not the most qualified. Buy this workbook and don’t let that happen to you. I can’t guarantee that you’ll get the job. But if you complete this workbook course, I guarantee you will be able to present to an employer what you can offer them in the most effective way possible.